Bubsy 3D is famous for being a trainwreck of a game. It was one of the very first 3D platformers, but it was in the unlucky position of coming out after games like Super Mario 64 and Crash Bandicoot (though just by a few months — Mario 64 launched June 23, 2006; Crash launched September 9; and Bubsy launched October 31). There are pull quotes on the cover, supposedly from reviews of the game, that present the contents of this jewel case as something of a masterpiece. One quote comes from the esteemed EGM, while the other mentions the game winning the “Gold X Award” from PSExtreme. 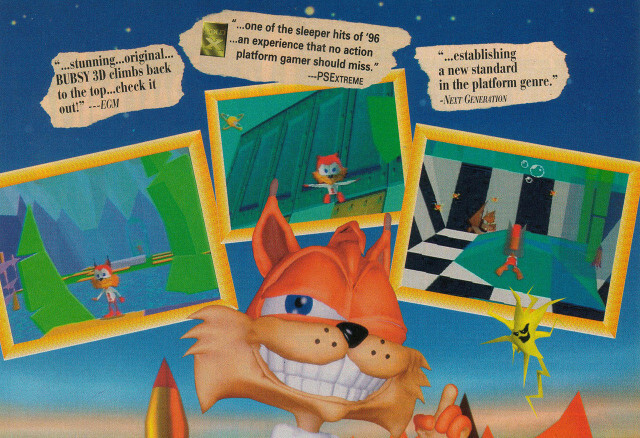 Two decades after the game’s release, it has definitely not stood the test of time; even Bubsy’s creator Michael Berlyn has referred to it as “my greatest failure.” This has caused many to question the validity of the pull quotes. In fact, an urban legend has sprung out of this that claims Accolade, the company who published the game, had completely fabricated these quotes in order to sell more copies of the game. Some have even gone so far as to suggest that neither the “Gold X Award” nor PSExtreme magazine had ever existed at all. In fact, even the Bubsy 3D Wikipedia page claimed that the award never existed at one point. Note the highlighted text in the screencap below. Now, all this makes for an interesting controversy, giving tinfoil-hat-wearing loonies plenty to talk about on Internet forums. Unfortunately for those guys, the legend is false. These pull quotes are actually real. Some people have complained that the quote was taken from preview coverage and not review coverage. To those people I must point out that this is actually a pretty common practice that still exists to this day. Having worked in the games journalism industry for several years, I can personally confirm that very few pull quotes you’ll see on the cover of a game are actually taken from reviews. In most cases, the game’s cover has already been printed before actual review copies are handed out. It’s just how the industry operates. 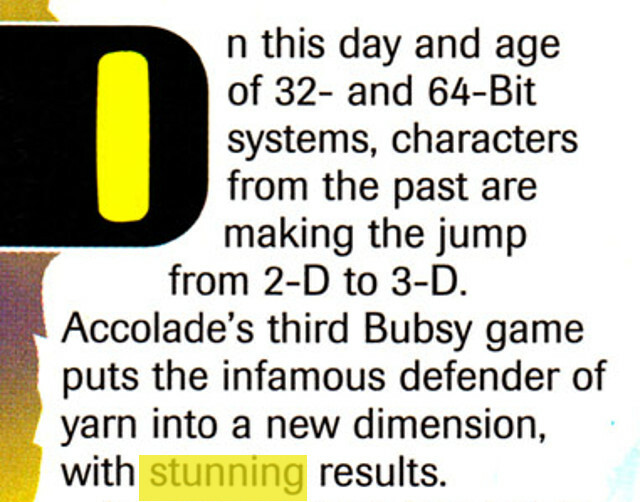 Of course, in the case of Bubsy 3D, EGM‘s review was quite a bit harsher than their enthusiastic preview. Perhaps people complaining about the quote are conflating the review and the preview. Again, the preview was pretty positive overall, and that was the source of the pull quotes. 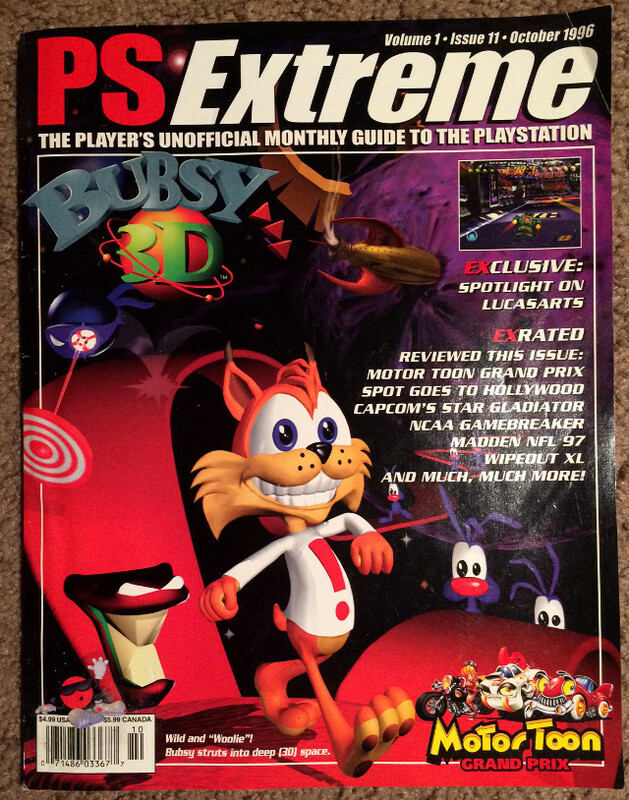 As for PSExtreme, the magazine absolutely did exist (though finding copies these days is extremely difficult), and it ran for almost a decade (though it had changed names a few times; it was PS-X at one point, and it relaunched as PSE2 in the PS2 era). 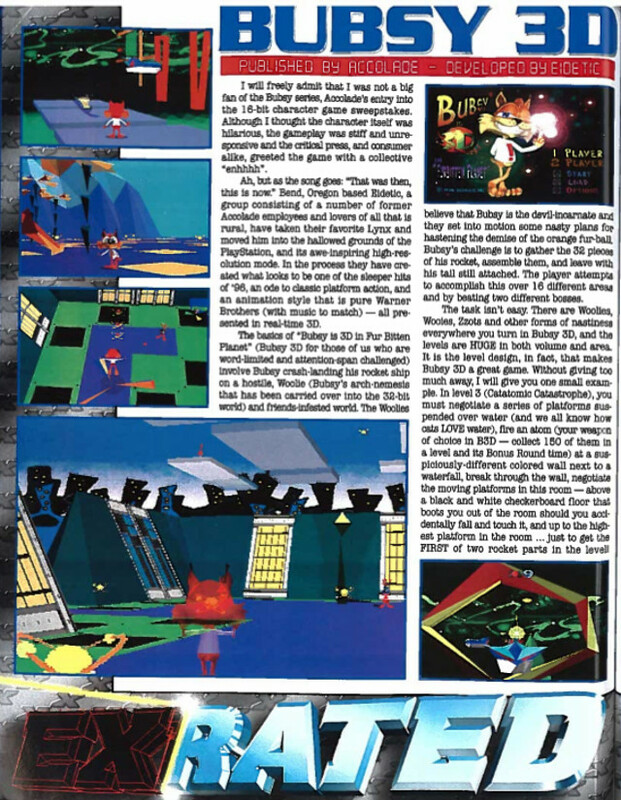 A preview for Bubsy 3D ran in the October, 1996, edition of the magazine (a copy of which exists in my personal collection). The Gold X Award was a thing it handed out to games with standout reviews. No, there was no award ceremony, nor was there a physical trophy of any kind to hand out, but the Gold X Award was simply a way the magazine could highlight standout reviews. 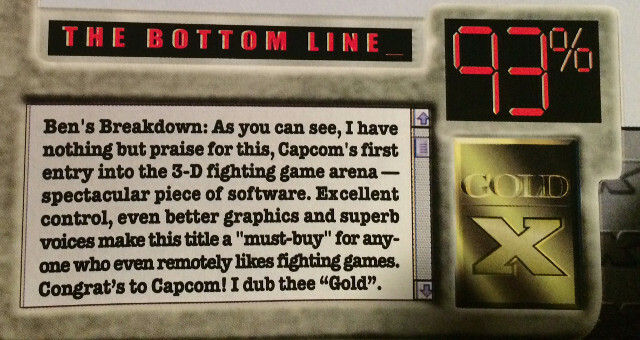 In the issue above, PSExtreme awarded a Gold X Award to Capcom’s Star Gladiator Episode I: Final Crusade. 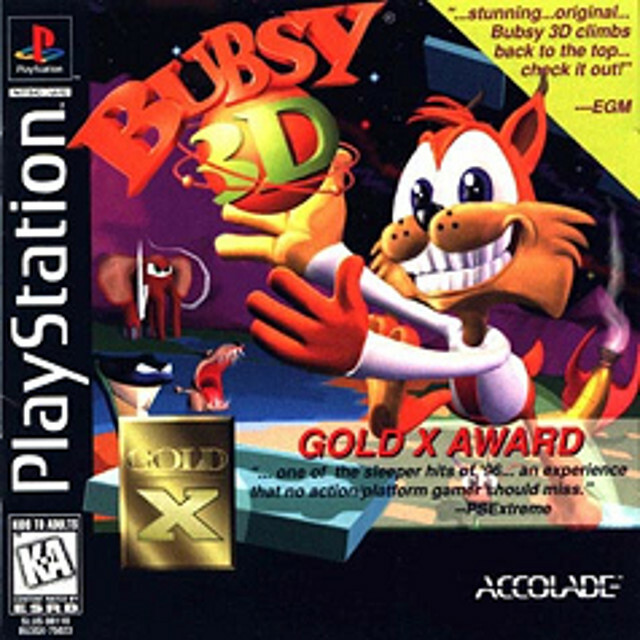 You’ll notice that the Gold X design matches the one featured on Bubsy 3D’s cover. To put the Gold X Award into a more contemporary context, Game Informer magazine has been known to do a similar thing, marking reviews as Gold, Silver, and Bronze. For example, on page 82 of Issue 253, they gave the Gold to Titanfall. So PSExtreme‘s practice of stamping awards on reviews is not unusual by any means. 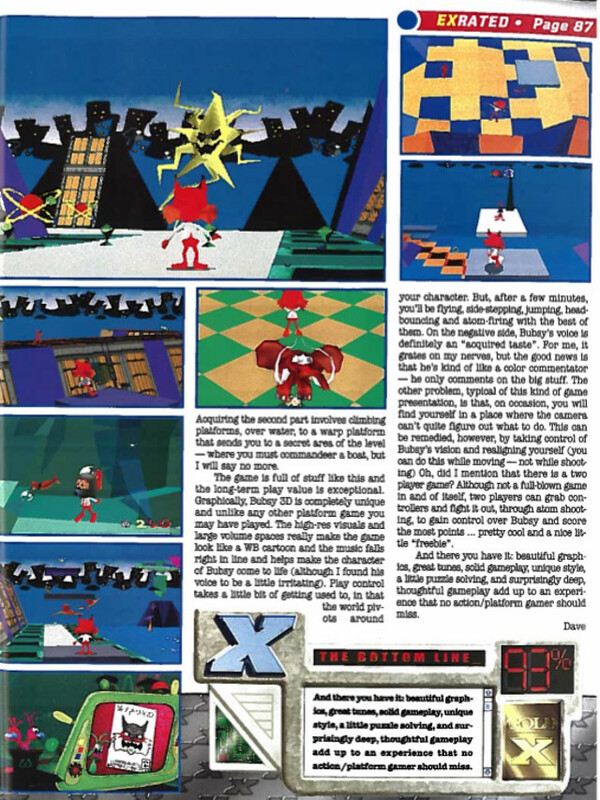 … one of the sleeper hits of ’96 …an experience that no action platform gamer should miss. Like the EGM review, this one was broken up. The first half of the quote comes from the second paragraph of the review, while the second half comes from the final line of the piece. So yes, that quote is also real. 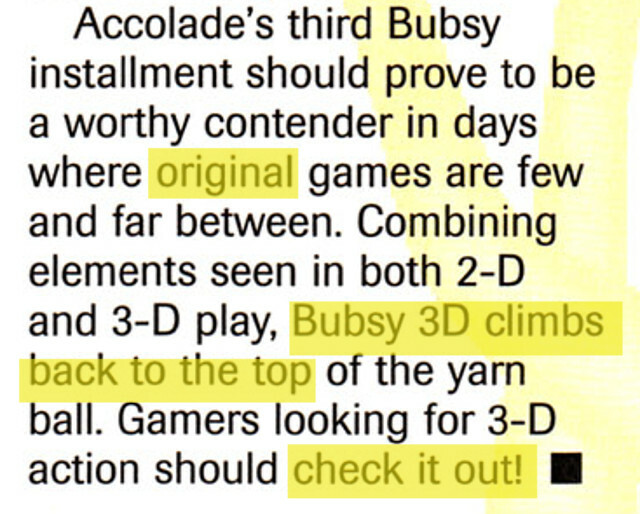 And after all that, hopefully we can finally put to rest the legend that Accolade posted fake pull quotes — and even made up an award — to make Bubsy 3D look cooler than it was.